This workshop is really special . . .
will be several choices of scrap to use to trim the inside. Hollander’s School of Book and Paper Arts. Ooh-la-la! This is one gorgeous book! You’ll use paper from the Graphic 45 “Couture” collection to create a stunning French door book. Untie the black satin ribbon to find a little 16 page text section under each door. 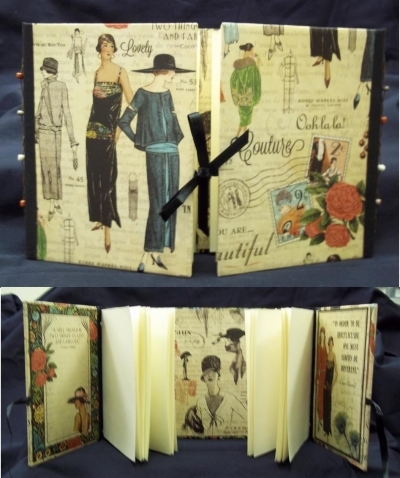 Look further and you’ll find vintage hats and journaling cards. Adorning this book is Irish linen book-cloth. You’ll learn the “laced dash” stitch trimmed with glass beads to sew your book with Irish waxed linen. Your class fee includes all materials. The written instructions will allow you to create as many more journals as you would like. Jan Lill Worms is a graduate of Hollanders School of Book and Paper Arts in Ann Arbor, MI. Attendees of past Stampaway classes may remember her as Jan Beineke. Bring: pencil, ruler, bone folder, awl, scissors, 1” foam or flat brush for gluing, an old wash rag to use for gluing and a transparent 12 “ ruler. Helpful if you have: paperback book at least 1” thick to use as a punching cradle (using it for this purpose will break the spine, so bring a book that can be “abused”).